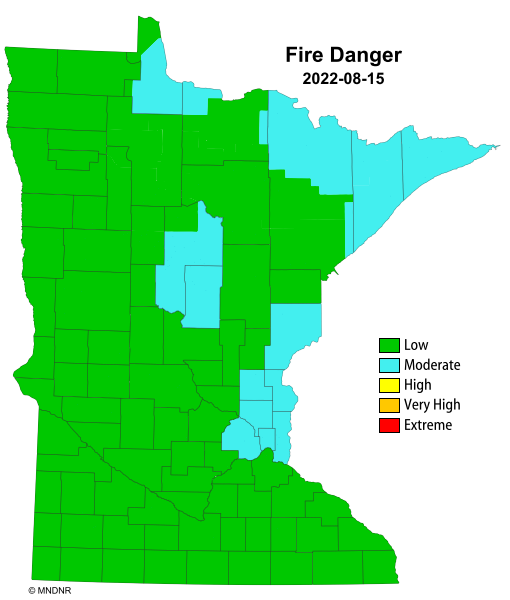 All recreational fires are governed by the Minnesota DNR as established by Minnesota Statutes and the Minnesota State Fire Code. The following are the rules, restrictions, and guidelines concerning recreational fires. RECREATIONAL FIRE An outdoor fire burning materials other than rubbish where the fuel being burned is not contained in an incinerator, outdoor fireplace, portable outdoor fireplace, barbecue grill or barbecue pit and has a total fuel area of 3 feet or less in diameter and 2 feet or less in height for pleasure, religious, ceremonial, cooking, warmth or similar purposes. PORTABLE OUTDOOR FIREPLACE A portable, outdoor, solid-fuel-burning fireplace that may be constructed of steel, concrete, clay or other noncombustible material. 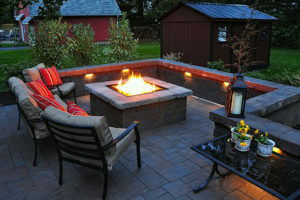 A portable outdoor fireplace may be open in design, or may be equipped with a small hearth opening and a short chimney or chimney opening in the top. Location - Recreational fires must be at least 25 feet from all buildings or combustible materials. Combustible materials are things such as wood, paper, and plastics. Conditions which could cause a fire to spread within 25 feet of a structure shall be eliminated prior to ignition. Attendance - Recreational fires must be constantly attended until the fire is extinguished. Fire Extinguishing Equipment – Buckets, shovels, garden hoses or a minimum of one portable fire extinguisher with a minimum 4- A rating shall be readily available at all times until the fire is extinguished. Fuels - The only materials permitted in a recreational fire are wood from trees and small branches. Treated lumber materials, construction debris, garbage, plastic materials, or waste materials are not allowed to be burned in recreational fires. Discontinuance - Recreational fires must be immediately extinguished if they pose a fire safety risk, if they are not in compliance with the above, or when directed to do so by the fire code official. Offensive Smoke and Odors - Special consideration must be given to prohibit/control objectionable smoke or odorous conditions. Portable outdoor fireplaces shall be used in accordance with the manufacturer’s instructions and shall not be operated within 15 feet of a structure or combustible material. They shall also comply with items 2 through 8 for recreational fires above. The Fire Department periodically restricts Recreational Fires due to hazardous, dry and windy weather conditions or based on MN DNR guidance. To determine if recreational fires are being permitted, please check the status on this page or contact the Fire Department at 651-552-4176.